Looking For Perfectly Baked, Yummy Cakes For Your Celebration? 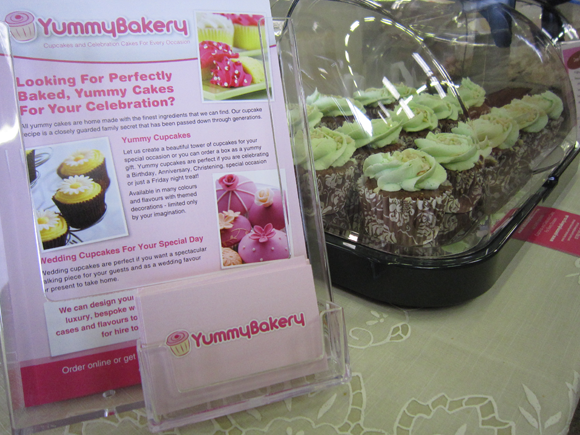 Yummy Bakery freshly bake cakes, brownies, cookies, gingerbread and cupcakes in Hadleigh Essex. We deliver locally and can provide cakes for all occasions. All yummy cakes are home made with the finest ingredients that we can find. Our cupcake recipe is a closely guarded family secret that has been passed down through generations. Yummy cupcakes are perfect if you are celebrating a Birthday, Anniversary, Christening, special occasion or just a Friday night treat! Available in many colours and flavours with themed decorations, limited only by your imagination. Wedding cupcakes are perfect if you want a spectacular talking piece for your guests and as a wedding favour or present to take home. We can design your cupcakes with you to produce your very own luxury, bespoke wedding cupcakes with the icing, decorations, cases and flavours to match your wedding. Stands are also available for hire to complete the display of your cakes. If you need a themed celebration cake for a Wedding, Birthday, Christening, Anniversary or any celebration, we can bake the perfect yummy cake for you. All cakes can be made in any size with either chocolate, vanilla or lemon Madeira sponge, filled with your choice of flavoured butter cream and then regal ice, marzipan or more yummy butter cream on top. We’ll then carefully box and deliver it locally. Please contact us in advance for availability.